In September 1992 I was appointed an associate lecturer at the Leeds College of Music to teach classical guitar making as part of the musical instrument technology course. It is a two year course and provides an introduction to the traditional methods of acoustic guitar construction and stringed instrument repairs. Teaching two days per week, my own output was reduced from twelve to eight guitars per year. However the reduction in my own work was compensated for by the invaluable experience I gained through teaching and exchanging ideas with the students. In 1999 I left the college in order to concentrate on my own work and to complete more orders. I still keep in touch with many of the students from Leeds and am proud to say some of them now have successful careers in instrument making and repairs. Sadly the course at Leeds College of Music was closed in 2005. There are still guitar and violin making courses in Newark, Manchester and London and Early musical instrument making at West Dean. 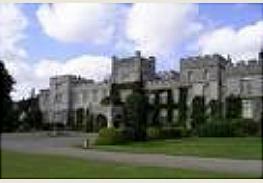 As well as the full time course in musical instrument making West Dean has also run short courses for over 25 years. 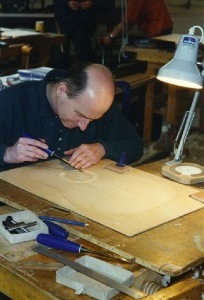 Starting in 2010 I will be teaching two short courses in guitar making. The first course of 4 days will run in January and is more of an introduction/preparation for the longer 9 day course which runs in April. Details of this and all the other instrument making courses is available at West Dean college. I am always pleased to offer advice on any aspect of guitar making or setting up a workshop and may offer one to one workshops at sometime in the future.